I must admit that the blog didnt have as much wine as i thought i wanted to have at first so today we start a new chapter proposing somke interesting "underground" wines. Ocean from Idaia winery was my first attempt of the cretan variety Thrapasthiri which dominates this blend with chardonnay. I am so excited with the potential the grape seem to have. The wine looks Greenish gold colored and the nose smells like Lemon, Peach, and Pear. It tastes like Apple, and Peach with a satisfying length while body is Medium. 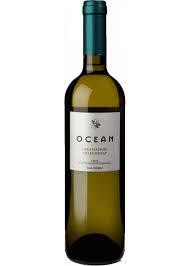 The wine lacks acidity but the Round texture makes it a great companion for many kinds of food. Thumps up the Idaia winery and Thrapsathiri which i believe in the end it will end up as the strongest cretan white grape. One thing they need to reconsider is the price. You cant demand 9-10 euro in Greece 2013 for a wine that still needs to proof a lot before it can justify the price. Αναρτήθηκε από ΕΥΖΩΙΣΤΗΣ στις 12:51 μ.μ.